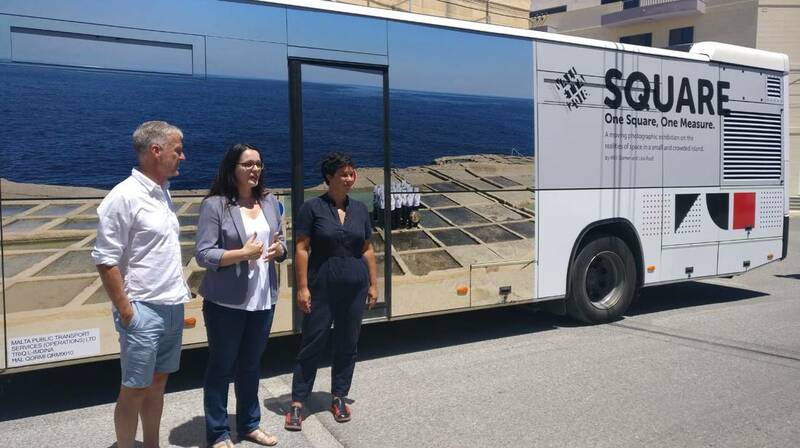 One of the buses carrying one of the photographs from Square, Valletta 2018's moving exhibition. Square is Valletta 2018’s moving visual arts exhibition, which highlights the realities of space in a small and crowded archipelago of islands. The square is made up of anonymised people that represent a densely populated living unit, which is placed in relation to different environments found in the country: natural, built, and in between. At 1,562 people per square kilometre, Malta has one of the highest population densities in the entire world. The relationship between people and their space is an important one in Malta and Gozo, and artists Willi Dorner and Lisa Rastl explore this notion through the use of a simple square as a basic unit of measure. This moving photographic exhibition will be travelling on select public transport buses, and will also be showcased on the construction site hoarding at MUŻA in Valletta, and billboards in Msida and in Paola next to the Addolorata Cemetery. The anonymised people in the photos were selected following an open call last year in which participants were photographed dressed in black and white, while covering their faces with a white sheet of paper, symobilising anonymous, standardized and well-ordered inhabitants. This exhibition rolls out on the 29th June.